02:05 — Gareth Thomas: DEAD! 04:52 — The Musketeers: DEAD! 08:19 — Neil Gaiman: Adapting Good Omens for TV. 10:26 — Star Wars: Rogue One Trailer. 14:33 – Indiana Jones and the Temple of Doom (1984 film). 31:27 – Flotsam and Jetsam. 38:09 – Doctor Who: The New Adventures of Bernice Summerfield, Vol. 2. 58:45 – Farewell for this podcast! 59:58 — End theme, disclaimer, copyright, etc. Wikipedia: Indiana Jones and the Temple of Doom. Big Finish: The New Adventures of Bernice Summerfield, Vol. 1. TARDIS Data Core: The New Adventures of Bernice Summerfield, Vol. 2 (The Triumph of Sutekh). 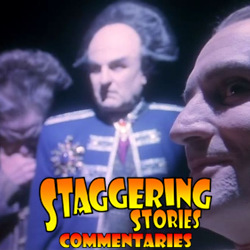 Adam J Purcell, Andy Simpkins and Keith Dunn sit down, returned, in front of the Season 4 Babylon 5 episode The Summoning, and spout our usual nonsense! The Lurker’s Guide to Babylon 5: The Summoning. Wikipedia: Babylon 5 – The Summoning. 05:05 — Dirk Gently: Casting. 06:46 — Blade Runner 2: Casting. 07:33 — X-Men New Mutants: Casting. 09:03 — Birthday: Fake Keith’s a year older. 10:19 — Milk: Cow alien abduction bottles. 11:44 — His Dark Materials: BBC mini series. 14:38 – Doctor Who: The New Adventures of Bernice Summerfield, Vol. 1. 32:57 – Raiders of the Lost Ark (1981 film). 56:17 – Farewell for this podcast! 56:58 — End theme, disclaimer, copyright, etc. TARDIS Data Core: The New Adventures of Bernice Summerfield, Vol. 1. Wikipedia: Raiders of the Lost Ark. Adam J Purcell, Andy Simpkins, Keith Dunn and Scott Fuller sit down, beetled, in front of the 2008 Doctor Who episode, Turn Left, and spout our usual nonsense! BBC: Doctor Who – Turn Left. Wikipedia: Doctor Who – Turn Left.